I had a 3rd grade homeroom that was struggling a little bit. They had a long term sub and a lot of kiddos who just need a lot of extra love and structure. 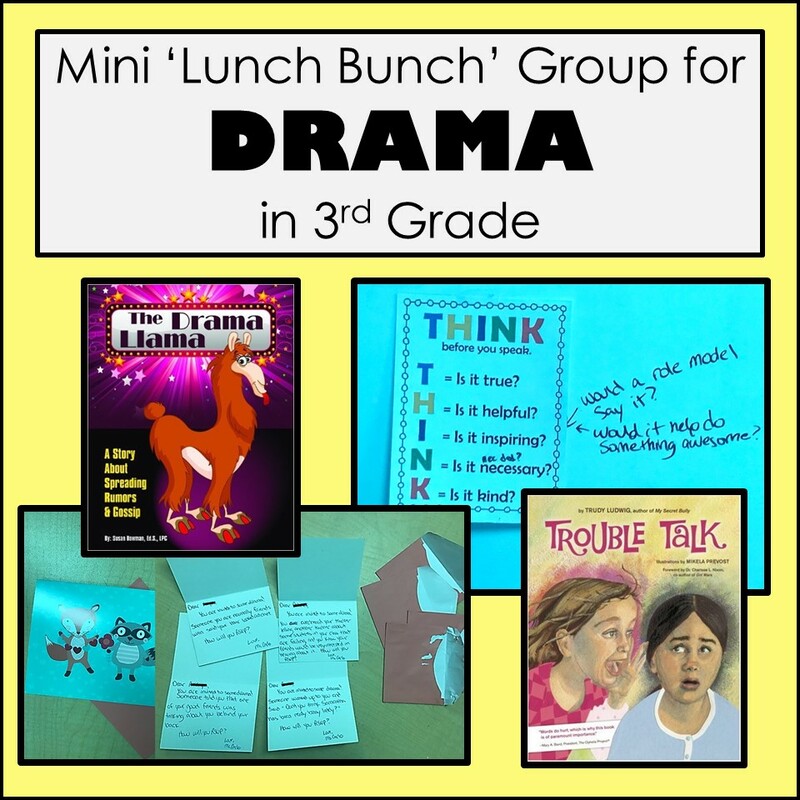 There’s a group of 5 in particular who were constantly finding themselves involved in drama with one another. Their reading teacher told me that she was spending about 15 minutes every day debriefing with them after lunch/recess before she was able to actually teach them. 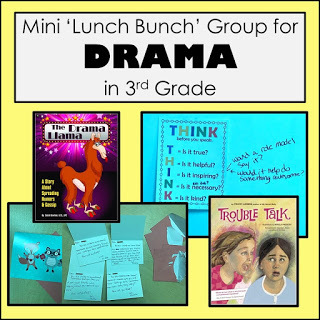 My attempt to help with this problem was to have a mini lunch-bunch group to finish out the end of the year with the drama llamas. This is a group of bright, highly-verbal, and fun students – 4 girls and 1 boy – and I knew they were going to be a hoot. I love lunch bunches because the teachers never have any problem with me pulling kids during lunch, but it’s hard to do a lot of activities when there are trays of food being eaten on the table, so I sometimes find them to be a challenge. Here’s a breakdown of what we did together. ***They knew pretty much immediately why they were all in the group. While I’m not sure that I had investment for change right away, they could all acknowledge that they were having these problems. talk about at lunch and recess other than other people. 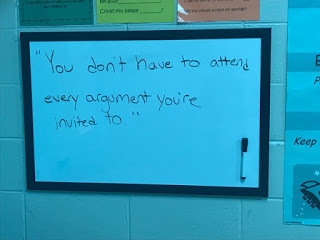 Put on quote/poster. I have blue covers over my flourescent lights and they make many of my photos super blue! 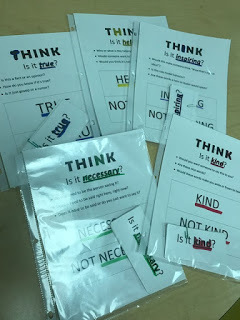 Introduce THINK acronym and ask how it connects to the story. 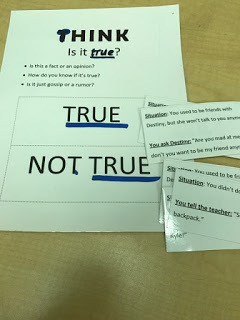 Do THINK card sorts (I used the sets I made for this lesson before I found a way better whole class option). 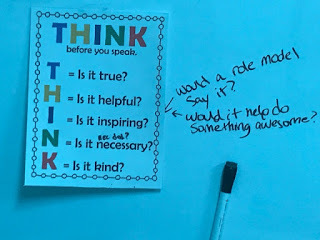 We discussed each THINK rule, then they took turns reading examples and we decided together if the examples broke or followed the rule. you’re invited to” on the board. 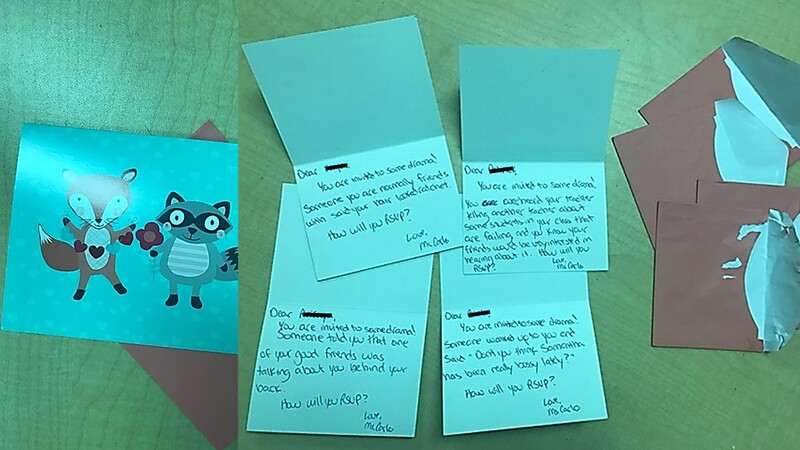 Using little blank cards from the Target dollar spot, I wrote the four kiddos at our last session each an “invitation” to participate in some 3rd grade drama. They took turns opening them, reading them aloud, and then talking through what they would do. 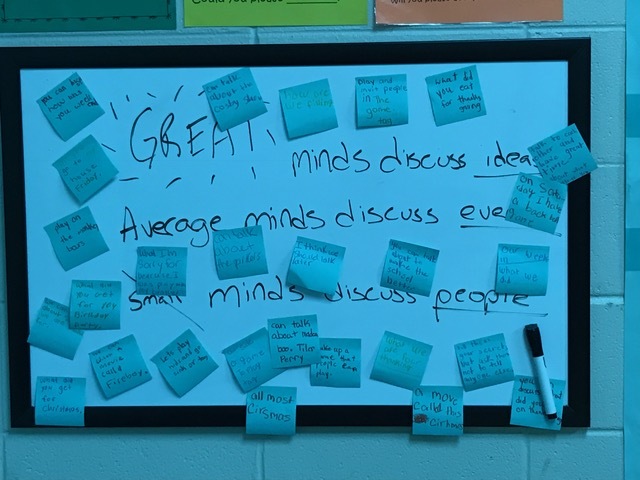 Scenarios were: friend insulted your hair, someone said one of your good friends was talking about you behind your back, you overheard a teacher say one of your classmates was failing, and someone suggested a classmate has been really bossy lately. *I did use the word “ratchet” in one. It’s an ugly word – and also a word that one of the students in the group used a couple weeks prior about a classmate’s here. Using it here opened the door to discuss the power of our words even further. Because this was more a of “mini” group, I didn’t do any sort of pre/post. That said, anecdotally, these students have become much less involved in conflict and are wasting less class time on drama. Win!